Cooling Unit Selection Tool | Noren Thermal, Inc.
**Heat-exchanger performance when mounted on a standard enclosure (uninsulated and standard size as stated in data sheet) includes heat transfer from the heat exchanger and heat dissipation from the enclosure itself due to radiation. For custom enclosure size and exposed surfaces, the heat-dissipation from radiation is re-calculated for your specific application to estimate actual internal cabinet temperature. Fill out the form below and one of our respresentatives will contact you shortly. For optimal performance the Drop in Unit should be mounted on top of the enclosure to ensure the heat pipe core is in a vertical orientation. For optimal performance the Flush Mount Unit should be mounted on either side, the front (door), or the back to ensure the heat pipe core is in a vertical orientation. Maximum allowable air temperature inside of cabinet. Maximum expected air temperature outside of cabinet. 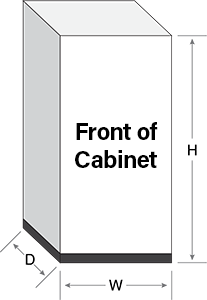 Maximum Heat Load generated by components in cabinet.